Below is some code that has been deliberately broken so that you can fix it. 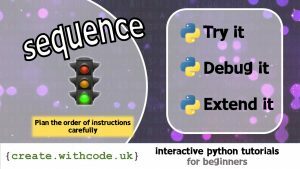 You don’t need to change any of the actual code, just rearrange the lines into a different order so that the sequence of instructions does what you need it to. Line 3 imports the turtle module which lets python know how to do drawing, but at the moment, the code tries to use a turtle object t before it’s been defined on line 21. Think about the steps needed to draw a triangle then change the order of these lines of code. What’s currently happening is that the turtle jumps to the top of the screen whilst the red pen is down on the screen so it draws a line. Change the order of the instructions so it lifts the pen up before moving. On the next page you’ll get some ideas for projects that work with sequences of instructions.